Imagine being young, pregnant and having nowhere to turn for support. Imagine being told by your parents that they are ashamed of you and that you will never amount to anything. Imagine feeling alone, like you’re the only teenager who has experienced an unplanned pregnancy. Imagine that the father of your baby has left you, because he doesn’t want anything to do with you or the baby. You are alone and scared. You are facing pregnancy, labor and birth alone. You have no one to be with you at the hospital while you birth your baby except for the nurses and doctors you don’t know. Giving birth alone, without any support from a friend, family member or familiar face sounds scary under any circumstance, whether you are a teenager or not. When this is the case, or if a young mom’s support system is unreliable or perhaps she just needs more support than they have, I offer the support of a doula. A doula will provide a young mother with unlimited emotional support, be an advocate and provide information so that she can make informed decisions regarding her and her baby’s care in the hospital. A doula also provides physical comfort measures and practical advice about labor and birth if asked. A doula does not make decisions for the young woman, nor can she give medical advice. The Young Women’s Resource Center’s Better Beginnings Doula Program was established in 2003 to offer this comprehensive, individualized support to the pregnant teens and young women in the community. The first doula program in the state of Iowa at the time was unique in that it specifically targeted an underserved population of pregnant women who otherwise could not afford the luxury of a doula. Most doulas are hired privately and are paid for by the client, as most insurance plans do not cover the cost. Since the program began over 12 years ago, nearly 375 young women have benefited from the support of a doula at no cost. The program is funded through grants and private donations so that the doulas can be paid for the services they provide. The YWRC contracts with doulas in the community to be matched with the young women who desire the support. The doulas meet with the client approximately 3 times before the baby is born to prepare her for labor and birth and to help her get ready for the early postpartum period. During this time, the doula is also building a trusting relationship with the young woman so that she is a familiar, continuous support for her during labor, birth and early postpartum. As the coordinator of the doula program, I see first-hand how having a doula has benefited many of these young women. They are no longer scared and don’t feel alone. They have had safe, memorable and empowering birth experiences by having the support of a doula. They are now strong, confident young moms. This is amazing! 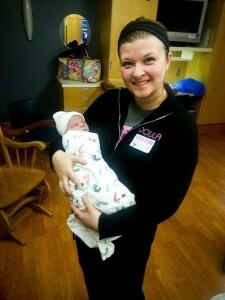 I would study to be a doula just to do this kind of work!